SUPERSLOWzone Exercise franchise business opportunity. Free SUPERSLOWzone Exercise business franchise information. SUPERSLOWzone, the foremost concept in integrating exercise, rehab (optional), and diet centers is growing with solid expansion. Locations are in <?xml:namespace prefix = st1 ns = "urn:schemas-microsoft-com:office:smarttags" />USA, Canada, Bahamas and Puerto Rico. Up to nine proven business-generating systems backed by a proprietary product/service combination, top-notch corporate leadership and unparalleled franchise support afford exceptional advantages for qualified franchisees. 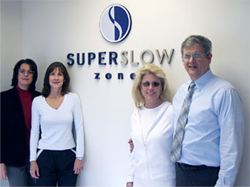 SUPERSLOWzone attracts a Loyal Customer base with integrated Exercise and Diet Centers. "I was intrigued by the unique SuperSlow exercise protocol and by the controlled environment that guaranteed the proper implementation and success of the program. Today, I am a SUPERSLOWzone franchise owner and I am proud to help raise the standards of the health and fitness industry." Is a SUPERSLOWzone franchise right for you? If you're an entrepreneur at heart with a desire to take part in the emerging state-of-the-art standard for the health and fitness industry - SUPERSLOWzone may be the ideal opportunity you've been seeking. To learn more about the SUPERSLOWzone Exercise franchise opportunity, simply complete the form below.